CTV's "The Listener" will make a quiet exit with its series finale on Monday, after a five season, 65-episode run. 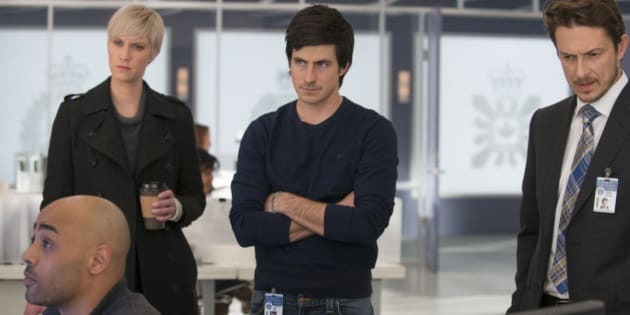 The procedural drama follows paramedic Toby Logan (Halifax's Craig Olejnik), a telepath, who helps solve crimes while coming to terms with his own powers and checkered past. But, it's hard to say if Olejnik's Logan could have seen this cancellation coming. Since its June 3, 2009 premiere on SPACE and CTV, the series became a modest success thanks to its many cliffhangers and plot twists, and strong supporting cast of Lauren Lee Smith, Rainbow Sun Francks, Ennis Esmer, Tara Spencer-Nairn and Kris Holden-Reid, among others. The show also continued to be a Top 20 hit in Canada well into its current season. According to Canada's BBM rating rankings, its July 21 episode earned 1.14 million viewers nationwide (15th ranked show of the week) and July 28th's airing earned 994,000 eyes (18th overall). The series was licensed in over 120 countries at its peak, and reruns continue to air on ION Television in the U.S., the network that became the show's co-production partner for its fifth and final season. Back in 2009, the first season of "The Listener" aired on NBC as a summer series, but was pulled before completion due to low ratings. Shot at Toronto's Pinewood Studios, the explosive show survived several revamps, relocations and creative reinventions, including a reported replacement of its writing staff before the start of season two. Plus, in its third season, the series aired one crossover episode with "Flashpoint"s Sergio Di Zio, who appeared on "The Listener" in character. However, the popularity of the 75-episode smash "Flashpoint" did not spread to its sister criminal drama. As for its star, Olejnik tells TV, eh? his five-year journey with his "blue steel"-eyed character was tremendously "worthwhile." "Thanks for sticking with us and supporting us and watching us loyally every week and for bumping into us and showing joy for the show," said Olejnik. "It’s been incredibly rewarding." The series' final episode promises a satisfying conclusion to the show's storylines, and will answer outstanding questions regarding Logan's history. "The Listener"s series finale will air on Monday, Aug. 18 on CTV and CTV GO at 9 p.m. ET/PT.